"Having served as a Christian minister for 50 years, I am delighted to see my faith discussed in public. However, I am not pleased to see my faith used in a utilitarian manner whether the issue is personal forgiveness or national politics." Gaddy parroted almost every national newsman and religious commentator on staff at newspapers, radio and television stations - that Hume should not have evangelized on a TV news program. "Tiger Woods will recover as a golfer. Whether he can recover as a person, I think is a very open question. Its a tragic situation with him. I think he has lost his family. Its not clear to me whether he will be able to have a relationship with his children. But the Tiger Woods that emerges once the news value dies out of this scandal; the extent to which he can recover, it seems to me, depends on his faith. He's said to be a Buddhist. I don't think that faith offers the kind of forgiveness and redemption that is offered by the Christian faith. So my message to Tiger would be: Tiger, turn to the Christian faith and you can make a total recovery and be a great example to the world." "My sense about Tiger is, is that he needs something that Christianity especially provides and gives and offers. And that is redemption and forgiveness...I think that Jesus Christ offers Tiger Woods something that Tiger Woods badly needs...If Tiger Woods would make a true conversion, we would know it. It would show through in his being. And he would know it above all, and he would feel the extraordinary blessing that that would be. And it would shine because he is so prominent. It would be a shining light and I think it would be a magnificent thing to witness." "...that I may open my mouth boldly, to make known the mystery of the gospel...that therein I may speak boldly, as I ought to speak." 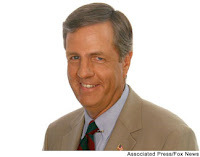 Hats off to Brit Hume for his obedience!